Maglev trains were used to transport cargo between cities on planets. A band of opportunist pirates took one of these trains and somehow managed to convert it into a spacefaring vessel. This train was also carrying a large amount of missiles and a replicator that could have been repurposed to extend the amount of mileage out of them. The pirates didn't get too far out in the stars though before the Rebellion arrived and they were "recruited" by the Federation to help them in their mission to save it, if only because if the Federation wins, pirates will have an easier time doing what pirates did due to the Federation's lack of automated ships. 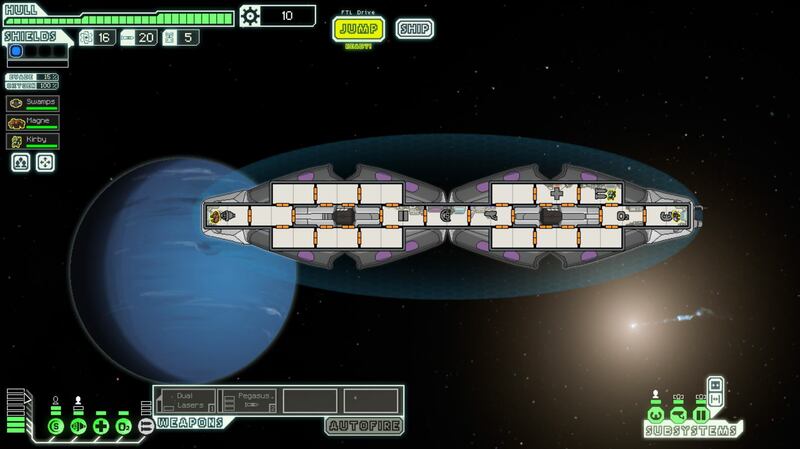 Well it's a standard FTL ship with a laser and missile combo. However, I decided to give it a Pegasus Missile so it can get some great use out of it until of course better guns can be found. The main gimmick is that it's got a big bottleneck in the middle and a long length so some rooms might be hard to get into and even harder when hacked. If you get a teleporter, it's also rather inconvenient due to the location of the medbay. I tried making the ship fit but the game is actually rather strict on where the ship offset can be so I can't fix piloting. stylesrj wrote: I tried making the ship fit but the game is actually rather strict on where the ship offset can be so I can't fix piloting. .txt file I know that X_ and Y_OFFSET can't be negative since the AE update, but is there a limit to how much negative you can put on the HORIZONTAL value? Every 35 there would be equivalent to 1 on the OFFSET, so I would assume Superluminal prevents you from going beyond 34 and you may have to manually edit the file to place a larger value. Junkyard has FTL mods, mostly ships and a few other things. Perhaps you can test it out for yourself; see if you can make a ship that defies the offset limits. Setting HORIZONTAL to -100 works. That will place the back room next to the crew list, and your front room won't be covered by the enemy window until you reach the flagship. And this moves everything back and not just the hull image?